Citizen Relations, on behalf of Princess Cruises, writes that if Americans could only accomplish one goal in their lifetime, 72% would choose a travel goal. Who do most travel-hungry Americans want by their side? Results show that 67% want their significant others as their travel companions, followed by their children (32%), friends (31%), parents (23%), and siblings (22%). Something in the air puts cruise passengers in a joyful mood. Cruises are not expensive. A four-day cruise can cost about the same as an average airline ticket. On most cruises, the price includes accommodation, entertainment, activities and an unlimited supply of food. All-inclusive cruises make them perfect for family reunions. It makes more sense than getting together in a hotel with the addition of meal expense. Pick a time that’s convenient for everyone. If you have school kids, select a sailing date when they’re out of school. Secure group rates or perks, which might include discounts or on-board credits redeemable at the ship’s gift shops, bars, and spa. 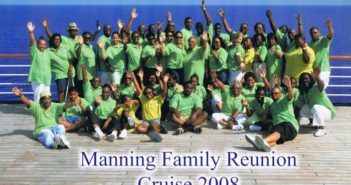 Book your family reunion cruise nine to 12 months in advance. Advance booking gets you better pricing and allows your members to make several small payments instead of paying all at once. Cruise ships are filled with activities. But make time for cards, dominoes, or other games your family enjoys. The whole point is for family members to spend time together. Don’t book online. Use a cruise specialist. Joan Curtis Waters, Charlotte Hall, Maryland, is a master of finding door prizes and things for goodie bags for the Curtis Butler Family Reunion. Baltimore Harbor Cruises donated two free lunch cruise passes and Dandy Dinner Boat Cruises gave discount dinner cruise coupons. 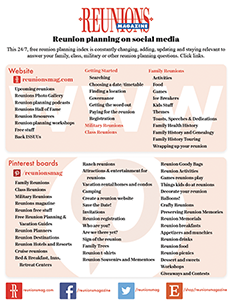 One family hosted events as fundraisers between reunions. Among the events they were choosing and depending upon interest from family, weekend cruises. Bus trips, dinner sales, and product sales were also explored. According to Eleanor C. Herd, Ohatchee, Alabama, the Crook Family Reunion in Destin, Florida, took an exciting and educational cruise in the Gulf of Mexico on the glass-bottom boat, “Southern Star.” Everybody was excited about seeing dolphins and other fish close up in their natural habitat. Along Wisconsin’s Great Mississippi River Road, there are sailboat cruises on Lake Pepin where you can learn about history and ecology, spot a bald eagle or two and watch the world go by! Or take a wildlife eco-tour with Mississippi Explorer’s Backwater Cruises on the Mississippi River, from La Crosse, once one of the busiest steamboat ports on the Upper Mississippi River. See bald eagles and eagle nests, beavers and beaver lodges, sunning turtles and playful otters. Or in a slightly more ostentatious, a sightseeing cruise aboard the La Crosse Queen paddle wheeler is a modern day replica of the grand riverboats used to ply the Mississippi in the early 1900s. Or if you’re in Norfolk, Virginia, a very popular reunion town, you want to take the harbor cruise aboard the American Rover. April through October she sails the smooth waters of the Elizabeth River on daily 1 ½ and 2 hour narrated harbor and sunset cruises. 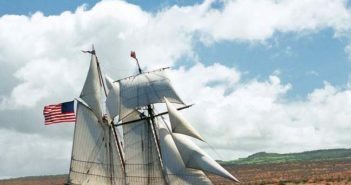 Guests can lend a hand with the sails, take a turn at the helm or just enjoy the experience. Attractions such as the NAUTICUS museum and USS Wisconsin battleship offer fascinating water/sailing/cruising history.